Nemi at the same time. From here, the waters reflecting the sun within the surrounding circular brim of the ancient volcanic craters, remind us of a large pair of spectacles. 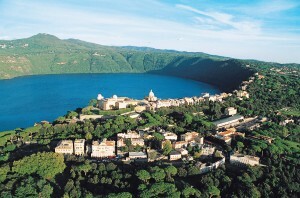 It is also called the Lake of Castel Gandolfo as the waters reflect the town where the Papal residence is located. 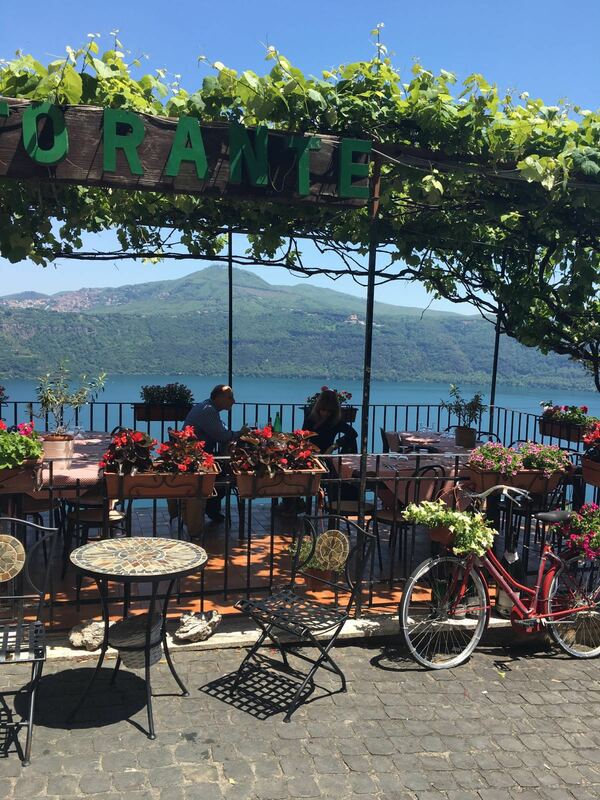 With a depth of 170 metres, it holds the record for Italian volcanic lakes and is a destination for water sports lovers with particular interest to rowing, sailing and diving. Along the perimeter of the low banks, approximately 10 kilometres, you can often find roadrunners training. 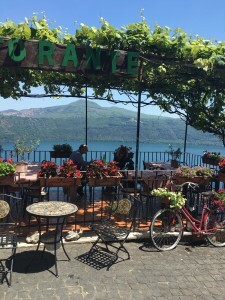 It is not only for sport that Lake Albano is frequented. Its charming landscape, rich vegetation and archaeological and historical-artistic evidence make it a pleasant and interesting spot for relaxation and educational walks. underlying springs. 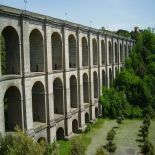 In 397 BC, the Romans carried out an enormous hydraulic engineering enterprise: an artificial emissary, which allowed the waters of the Lake to reach the sea in order to control the level. Further visible evidence of Roman Age are the Doric Nymphaeum and the Bergantino Nymphaeum. 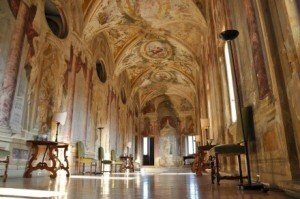 From the Medieval Age you can see the Convento di Palazzolo and a few remains belonging to the Romitorio di S. Angelo. 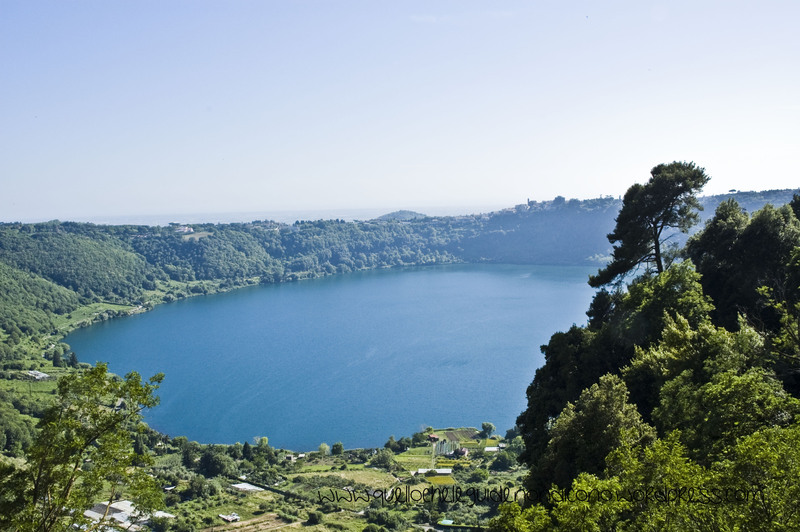 It is the smallest of the two Castelli Romani lakes and in ancient times was also called Specchio di Diana (“Diana’s Mirror”) because of the Sacred Woods and the Temple-Sanctuary of Diana Nemorensis (p.10), the Goddess of Woods, situated along the banks. 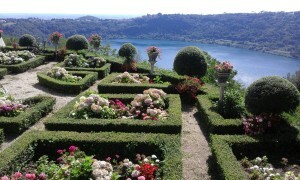 Lake Nemi was appreciated as an entertainment and holiday location of by the ancient Romans. Emperor Caligula organized enormous celebrations in honour of Diana on his two famous ships, which were anchored in the centre of this small volcanic lake. 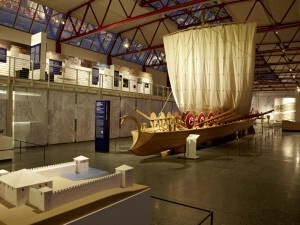 The remains of the ships can be seen today at the Museum of Roman Ships (p.11) located on the banks of the same lake. Today, a large part of the banks of the lake is taken up by cultivations of tasty good quality strawberries for which the attractive medieval town of Nemi has become renown. According to the Goletta dei Laghi report in 2009, it is considered possible to bath in the lake in its complete form, except for the area in front of the Museum of Roman Ships. In a splendid position overlooking Lake Albano, Castle Gandolfo is situated on the brink of a volcanic crater. 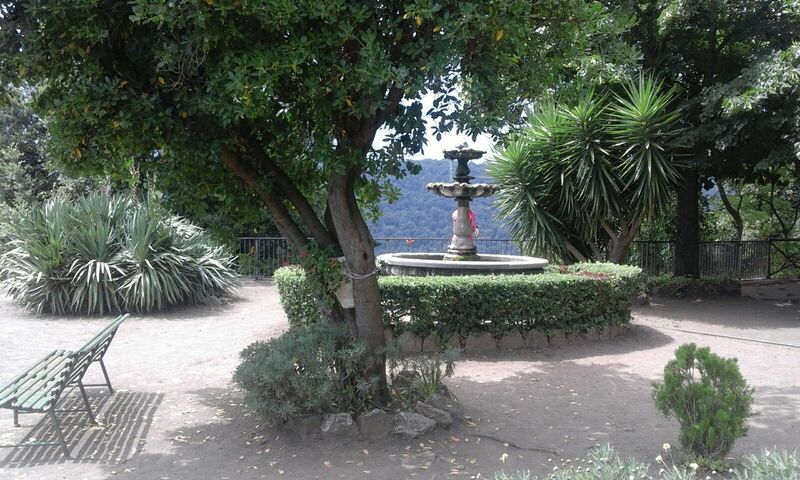 The town is known for the beauty of the surrounding nature and its elegant historical centre encircled by the wall. 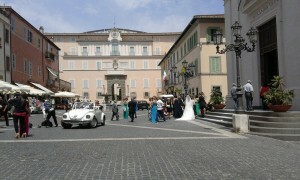 It has been elected one of the most beautiful villages in Italy. Above all, the small town is famous for the Papal Palace where Popes have spent their summers since the 176 century. 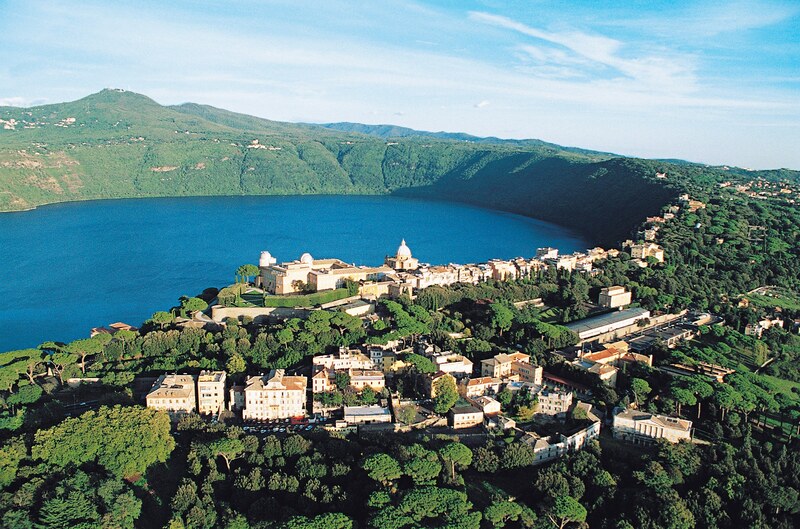 After all, Castel Gandolfo and neighbouring towns were favourite places to build summer residences as far back as ancient Roman times, initially by patrician families and emperors and later by important clergy and noble Romans. Evidence of ancient Roman times are the remains of the Villa di Domiziano (Domitian’s Villa) to which the Ninfeo Bergantino belongs. 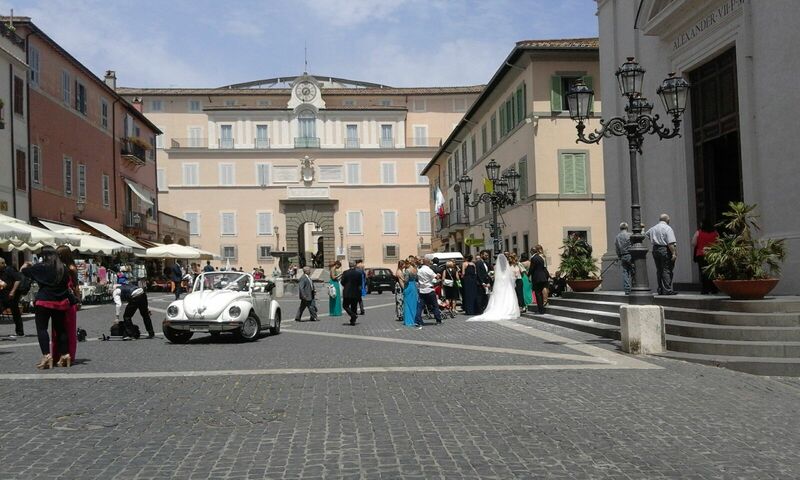 The villas and other residences surviving today such as the Chiesa di San Tommaso di Villanova (Church of St. Thomas of Villanova) were mostly built as of the 17th century when Castel Gandolfo became property of the the Holy See. Its history is very ancient as its origins go back to the town of Alba Longa. Lying deep in the sacred woods that once were dedicated to Diana Nemorensis (also known as Diana of Nemi), is a charming medieval borgo well known nowadays for the delicious strawberries Gently resting along the border of the crater and surrounded by woods, Nemi overlooks the small volcanic lake bearing the same name. The charm of this small town of ancient origins and medieval aspect with its towers reflecting on the blue water of the lake surrounded by rushes and strawberry greenhouses, has seduced poets and painters and still enchants the many tourists visiting today. The history of Nemi is ancient and important. Because of the Tempio di Diana Nemorense (Temple of Diana Nemorensis), which was situated here, the area was already considered sacred by the Latin League. Later, it was also favoured by the Romans and Caligula, who decided to keep his two big ships used as banquet halls, anchored here. What is left of the vessels is conserved in the interesting Museo delle Navi Romane (Museum of the Roman Ships). The origins of this part of the world are lost in myth, so much so that Cicero called these hills the ‘uterus of Rome’. The Castelli Romani area had a central rote in several events connected to the Eternal City: in fact it was here that Alba Longa was located. Legend has it that it was founded by Ascanius, son of Aeneas and was the capital of the famous Latium or Latin Civilisation. In the Tri century B.C.. Alba Longa was definitively conquered by Rome, after the legendary battle between the Horatii and the Curatii, and with it the whole Castelli Romani territory fell under the influence of the growing Roman civilisation. 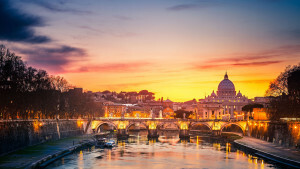 The area has always appealed to Rome’s affluent families and is full of the remains of villas and residences which belonged to noteworthy figures such as Marcus Tullius Cicero. Seneca, Domitian and Caius Julius Caesar, on the ruins of which stand entire villages. Among the most famous ancient towns in this area, the city of Tusculum cannot be forgotten. According to legend, it was founded by Telegonus, son of Homer’s mythical hero Ulysses. Located on the volcanic ridge of Mount Tuscola, the small city played a main role in the famous battle of Lake Regillo, where the Latiums were beaten by the Romans who had help from the Dioscuri Castor and Pollux themselves, or so legend has it. It yielded definitively when the Romans destroyed the city and razed it to the ground in 1191 for sheltering Frederick Barbarossa who was fighting the Romans at the time. The area where it once stood, where today lie the municipalities of Monte Compatri, Frascati, Grottaferrata and Monte Porzio Catone, was partially for grazing and partially woodland. 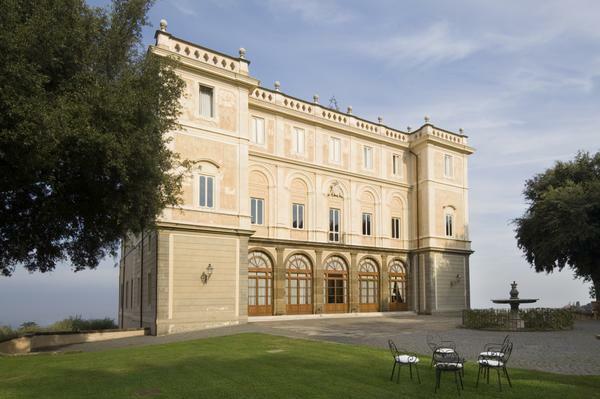 From Castles to sumptuous Villas The name ‘Castelli Romani’ indicates an area that includes a group of neighbouring municipalities to the south of Rome. The origin of this name dates back to the 14m century when, after the difficult period of the so-called Avignon Papacy, the process known as ‘encastellation’ began: some residents of Rome moved to the feudal castles owned by some rich Roman families in this area. 1500s, when a period of peace began that would last two centuries and allow the urban, architectural and artistic/cultural development of the zone. The architects of this long stretch of prosperity were the powerful families who owned feuds here, such as the Colonnas, the Chigis, the Sforzas and the Borgheses. 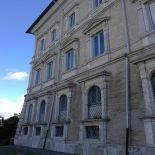 It was during this period that the appearance of the Castelli Romani area was further embellished with the construction of numerous monumental buildings: from majestic Tuscolan villas such as Villa Nlondranone. Villa Falconien. 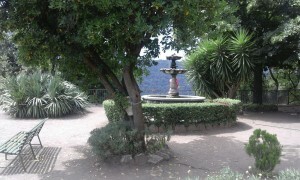 Villa Rufinella, Villa Grazioli and Villa Aldobrandini to the Pope’s summer residence in Castel Gandolfo. The eastern Romani area today In 1870. having been the focus of the most powerful Roman families and Popes for centuries, the Alban Hills area was annexed to the Kingdom of Italy and a series of infrastructural works was begun which improved rail and road connections and made the area a popular destination for travellers from all over Europe. The Second World War was a particularly painful time for the Castelli municipalities which were at the centre of Anglo-American bombardment. Despite this. the economy in the Castelli Romani area recovered immediately after the conflict, especially in the agricultural sector, and has remained healthy to this day. 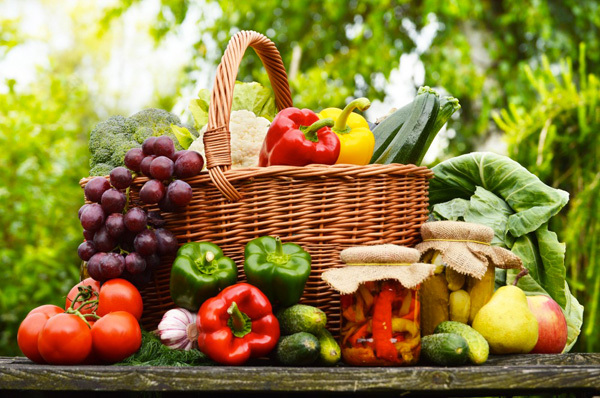 Touring the fraschette is an activity to which you should devote yourselves assiduously. The fraschetta is a typical inn of the Castelli Romani area, with ancient origins connected to the move of carters from the countryside to Rome and the places where they stopped for refreshment. 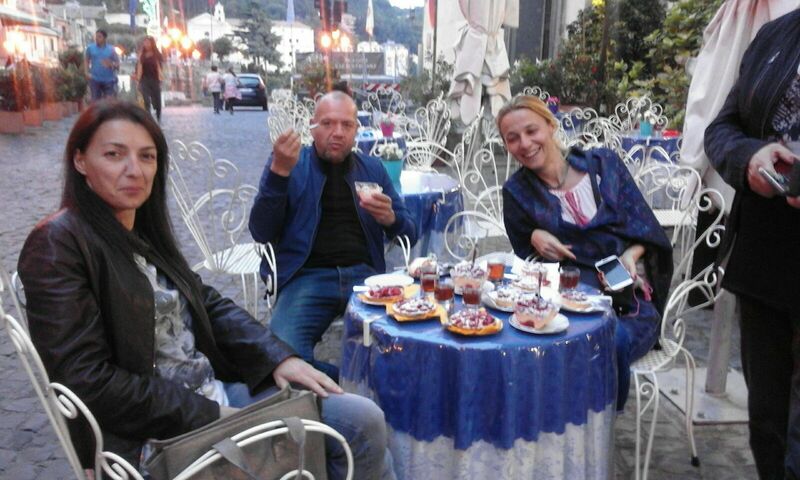 Today most of the fraschette offer traditional Castelli Romani cuisine, while some maintain the tradition of selling only wine to their customers who bring their own food. 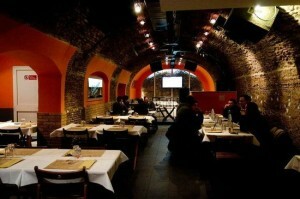 Try the Lane Pelose in Monti Prenestini. same diameter as a chunky bucatino pasta with a tapered tip. Typical of Prenestine cuisine, these are served with meat sauce, Iamb ragu and artichokes, You will also eat these gnocchetti from the typical ‘scifette’, rectangular containers made from wood: a real blast from the past. Speaking of fresh pasta, another typical dish from Castelli Romani and the municipality of Colonna in particular is pincinelle: a long round pasta. approximately 3 millimetres wide, made with a dough of flour, water and salt. Every menu also contains the local dishes that are now famous all over the world: delicious carbonara made with guanciale, egg, pepper and pecorino romano cheese; cacio e pepe whose ingredients are in the name (cacio e pepe means means pecorino romano cheese and pepper); amatriciana made with guanciale, tomato and pecorino romano cheese and gricia, similar to the amatriciana but without tomato. The second courses are often made with lamb or abbacchio as it is known here. In Roman dialect, this means milk-lamb, which has always been a dominant feature in the culinary tradition of Castelli Romani. The Abbacchio Romano, born and raised wild or semi-wild within the borders of Lazio is also PGI protected and has a ,r and le n mea •, It is ised in meat is seasoned with garlic, rosemary, salt and pepper to make roasted abbacchio which is served with potatoes. 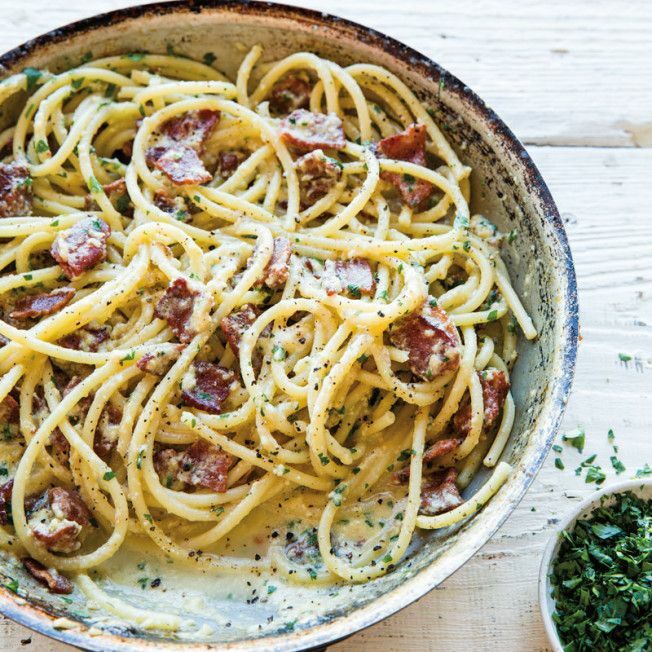 To make abbacchio ‘alla cacciatora’ it is slow-cooked in a casserole dish or pan and flavoured with anchovies, olives and tomatoes depending on the recipe. Abbacchio ribs are eaten ‘scottadito’ style – cooked on the grill or barbecue and served immediately (the name translates as finger-burners) or breaded and fried. 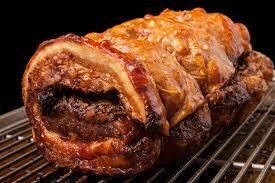 An ancient dish is the legendary Tordo matto di Zagarolo, rolled horsemeat with crushed lard. parsley, garlic, sage, coriander, chili and salt which is cooked in the embers, roasted or pan-cooked with local red wine. 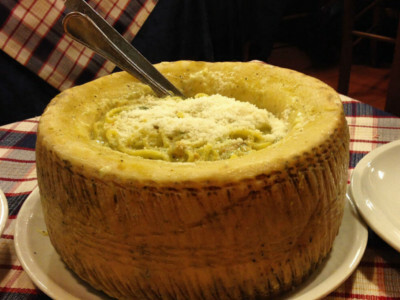 Tordo matto is made by the butchers of Zagarolo and it can also be found in some restaurants in Monti Prenestini. 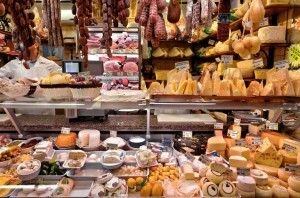 Other meat dishes, such as rabbit ‘alla cacciatora’ (with garlic, rosemary and vinegar) and humble sides that use the intestines or less noble parts of the animal such as pork tripe ‘alla romana’ with tomato sauce, mint and pecorino or beans with pork rind and iamb giblets. You must of course try the saltimbocca ‘alla romana’: a slice of veal pierced with a toothpick which holds a leaf of sage and a slice of prosciutto crudo, seared in oil and white wine. mixed salads which abound on Italian menus, will be pleased to know that sides are a serious business in Castelli Romani. This is the land of ripassate vegetables where the vegetables are tossed in a pan with oil and garlic, occasionally some chili, and potato and ramoracci (a flavoursome wild herb) frittatas. Then there is the chicory, puntarelle, artichokes, asparagus and broccoli; all with that slightly bitter taste and crunchy consistency that make them exceptional accompaniments to the hearty second courses in typical Castelli cuisine. King of sides is of course Artichoke ‘ells romana’, which is simmered in water and seasoned with garlic, mint and parsley, or perhaps oanzane.11a made with yesterdays soaked bread, fresh tomato and oregano You might never have tried it before but it is definitely worth a taste. The name is Scottone and it’s a cheese that is served… hot! You need to climb up to Rocca Priora to try it, because this is where Scottone is still produced to this day. It is a semi-liquid cheese, similar to ricotta, obtained after boiling sheep’s milk twice. The name (burner) reminds us that it should be served while it is still very hot in an earthenware bowl. The words ‘Castelli Romani’ immediately conjure up a getaway. 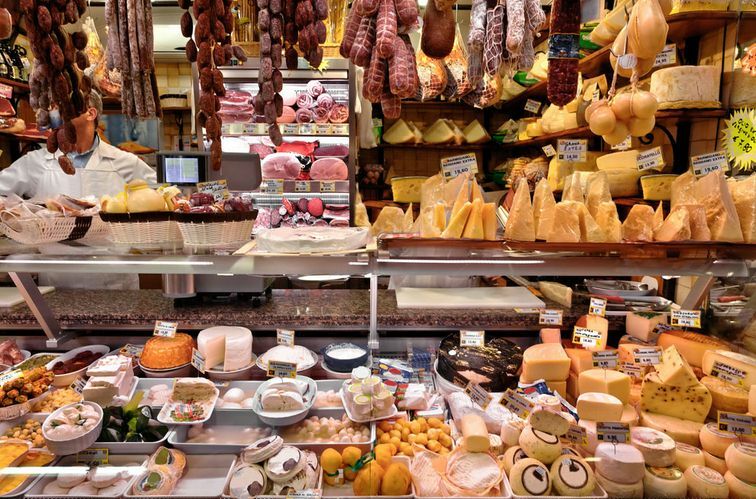 You get a longing for the kind of artisanal food products that made this land so perfect for gastronomic escapism Castelli Romani was made famous by history, cinema, literature and songs. It has widespread popularity ,and offers a simple welcome and a joyful atmosphere, as if it were always Sunday here, always a trip away, always a discovery. And Frascati DOCG is the life of the party. With its straw colour and delicate aroma, it is an excellent aperitif but also a faithful companion to all the best Roman cuisine. It is the most famous wine from Castelli and is produced in various types: Frascati Doc normaie (dry) or Spumante Frascati Superiore DOCG. Cannellino di Frascati DOCG (sweet wine from late harvest). All these are made with the Malvasia del Lazio or Puntinata, Malvasia di Candice Trebbiano Bellone and Bombino grapes. 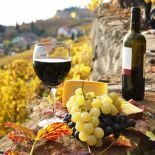 Frascati DOCG wines are a gastronomical triumph of the Castelli Romani area and are also made organically in some vineyards. In line with the wine tradition in Castelli Romani, the master gelato-maker Roberto Troiani has created a line of gelato with Castelli wines. Using the local must, he has created delicious ice-creams that are perfect for enjoying on a stroll or in original combinations with food. The wine ice-creams are creamy, sweet and flavoursome, characterised by an acidic note that is balanced by the scent and rich and consistent flavours of he wine. There is a flavour for everyone: Cannellino (cream, Cannellino, cinnamon and almond): Crema al Passito (Malvasia passita, cream and cinnamon); Frascati Superiore (Frascati DOCG, cream and green apple) and many more. 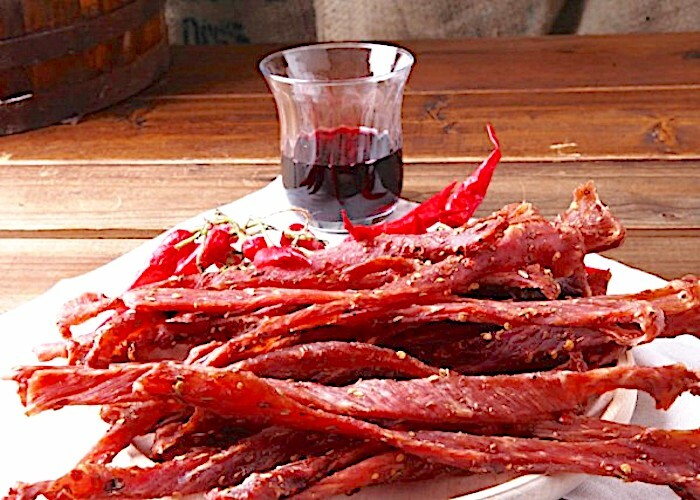 Among the local gastronomic specialities, the Castelli Romann norcinerias play a fundamental role: the Coppiette are spiced strips of dried pork. The manufacture process stars with the selection of the best cuts of meat which are then cut into strips and seasoned with salt, fennel seeds. chili, wine and various spices depending on the butcher’s recipe. Once seasoned, the strips are hung to dry and folded in half, hence the name coppietta (little couple). The coppietta should be bitten into with no hesitation or concern for etiquette, just like the old inn customers used to do who. stimulated by salt and spices, would then drink copious amounts of wine. In distant times, the coppietta was the inseparable companion of shepherds and legionary soldiers as it would keen for a long time in their saddlebags. Today it is eaten before, during and after meals, in the restaurant or as street food. It is a treat that is difficult to resist.